Defending champions Stray Lions inched closer to retaining the Nairobi Provincial Cricket Association (NPCA) super league title after successfully edging out Swamibapa by five wickets. The match played at Peponi School was the only one played on Sunday after heavy rains that had hit Nairobi for the better part of last week saw the other five matches washed out. Among the matches that were washed out was the one pitting former champions Kanbis and Sir Ali Muslim Club. This was the third wash out in four matches for Kanbis who are now 20 points behind Stray Lions. With eight points separating Stray Lions and Kanbis, the ground staff at Peponi School knew the importance of the match which is why they did everything possible to have the match played. However the match didn’t start on time as the outfield was waterlogged. This forced the players from both teams to chip in by assisting drain water and have the match played. This process took hours thus delaying the start. After several inspections by the umpires Isaac Oyieko and Charles Kariuki, the match began at 1 p.m. - four hours late. It was reduced to a 27 overs match. When the match bowled off, it was the home team who called the shots with both the bat and the ball. They were able to tame the visitors with a combination of spin and pace to bowl them out for 101 runs with 15 balls to play. And when they batted for the chase, the champions attacked their opponents with ease despite losing five wickets. Openers Nehemiah Odhiambo and Nikhil Date were in a class of their own as they beat the batsman with pace and bounce to lock any scoring gaps. Swamibapa began the inning poorly losing their top three wickets for 30 runs in 10 overs. 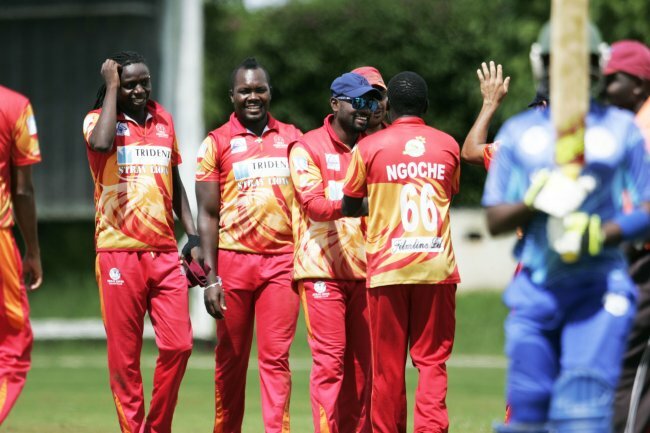 After having dismissed Irfan Karim, Shem Obado made it two for himself and four for his team by forcing Maurice Ouma to edge the ball into SH Srinivas hands with the board on 47 runs. Six runs into the fifth wicket stand, umpire Charles Kariuki turned down what appeared to be a clear caught behind appeal from Nehemiah Odhiambo. Naman Patel had edged the ball off the gloves to Abraham Vadada, but Kariuki looked unbothered with the appeal to give Naman a lifeline. The spinners continued with their good show on the wicket when Saumil Patel was beaten by a turn off Srinivas to leave the visitors on 75 for 6. Odhiambo made it seven down with the dismissal of a shaky Emmanuel Bundi. Naman who looked set to get the visitors into more reasonable score fell to a slow ball from Nikhil Date on 28. The Ngoche brothers stand of James Ngoche and Lameck Onyango yielded only 12 runs before Collins Obuya struck with his second delivery in the 24th over to bring the scores to 94. Hiren Varaiya hit the final nail on the coffin with the dismissal of Ngoche with the board on 101. Openers Vadada and Manoj Sai put on 38 before the stand was broken with the dismissal of Sai. Roger Mukasa playing his first match since playing in the first leg between the two teams added on nine before paving way for Collins Obuya. In the 15th over, James Ngoche received a huge wrath from Obuya who hit him for two consecutive sixes. This brought panic to Ngoche, and the left armer bowled three consecutive wides. But that was how far Obuya could go because he was caught at deep off Jadavji Bhimji with the scores on 71 after 15 overs. The damage was already done as the hosts wrapped up the win easily with five overs to play.